Today’s Feature Friday spotlights one of our retail partners in Kentucky: Adams & Sons. Eric Adams opened his shop earlier this year in Owensboro on the popular waterfront. Adams & Sons offers men a place to shop for what they really want. The store is not overstocked with inventory. Rather, Adams carries a carefully curated collection of American and European-made items in-store and works personally with his clients to source a perfect individualized look. Owensboro, originally named “Yellow Banks”, was first settled by Europeans in 1797. The Lewis and Clark Expedition wintered in the area prior to departing on its famed journey. In 1817, Yellow Banks was renamed “Owensborough”. The name was shortened to its current spelling in 1893. Owensboro is the birthplace of actor Johnny Depp and home to the International Bluegrass Museum. Kentucky is known as the Horse Capital of the World. Located in Lexington, Keeneland is a Kentucky treasure. Keeneland opened in 1936 and has long been considered one of the most beautiful horse racing facilities in the United States. Keeneland is listed on the National Register of Historic Places and has been recognized as a National Historic Landmark since 1986. It was recently named the top Thoroughbred racetrack in North America. Keeneland is hosting the 2015 Breeders’ Cup this week. Considering Keeneland’s place in Kentucky culture and prestige in the horse racing community, we are excited to announce that Dapper Classics was selected to knit socks exclusively for the Keeneland Gift Shop. 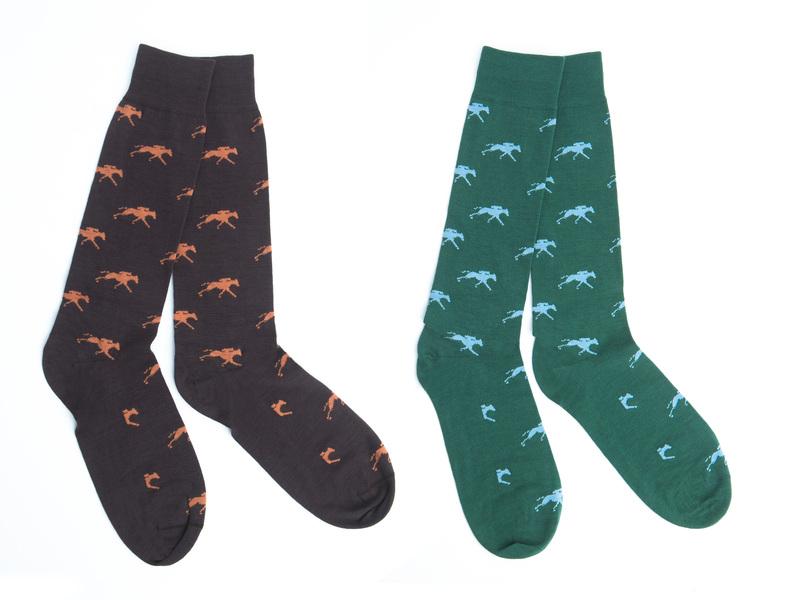 These custom socks come in four unique colorways, all featuring a pattern of the Keeneland logo. We’re thrilled that these socks will be in the Gift Shop for what will be an exciting and historic Fall season for Keeneland. 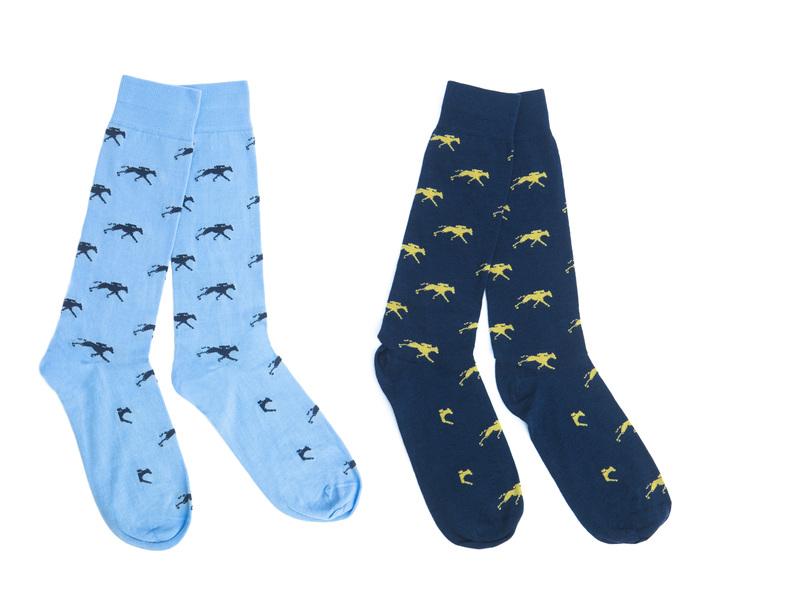 Celebrate Keeneland – Kentucky’s gem – in style with these limited edition socks! Today’s Feature Friday spotlights one of our retail partners in Missouri: Pinstripes. The store is located on the Country Club Plaza – the oldest lifestyle shopping center in America – in Kansas City. Last year the shop celebrated its 20th year in business. Pinstripes, known as Kansas City’s leading menswear store, offers a wide selection of men’s clothing – from boardroom to ballpark attire. Kansas City is the largest city in Missouri. Kansas City is nicknamed the “City of Fountains” for its more than 200 fountains. The fountains at Kauffman Stadium, home of the Kansas City Royals, are the largest privately funded fountains in the world. Kansas City is also known for its distinct steak and barbecue. Today’s Feature Friday spotlights one of our retail partners in Illinois: The Brass Horn. George Streckfuss opened The Brass Horn in the Brettwood Village shopping center in Decatur in 1990. The store moved to its current downtown location three years later. In 2005, George partnered with Ryan Spurlock, who began working at the store as a teenager in the 90’s. The Brass Horn offers a wide range of menswear – from tailored clothing to popular sportswear. Now in its 25th year of business, the store has become the premiere destination for menswear in Decatur. Founded in 1823, Decatur is located in central Illinois. The city is located within three hours of Chicago and St. Louis. Decatur was a former home of President Abraham Lincoln and the site of his first political speech. Decatur was also the original home of the NFL’s Chicago Bears. Today’s Feature Friday spotlights one of our retail partners in Tennessee: Five Seasons. Five Seasons is a family business that was founded in Union City in 1972. The store offers a wide range of menswear – from casual wear to custom clothing. The store also carries women’s clothing. Five Seasons opened a second location – a store in Martin, TN – in 2014. Union City is a small city located in northwest Tennessee. The city’s name derived from its location at the junction of two railroads. Union City is home to the Discovery Park of America, a world-class educational complex with exhibits focused on art, nature, science, history, and technology. Today’s Feature Friday spotlights our first retail partner in Minnesota: Marty Mathis Clothiers. Marty Mathis, the company’s namesake, launched Marty Mathis Direct in 1994 without a brick and mortar location. Eight years later, he opened the Marty Mathis Clothiers showroom in downtown Minneapolis. Mathis specializes in made-to-measure clothing that helps the shopper express his signature style. Mathis works to create timeless looks that exemplify the “new American classic”. The store is known for its creative window displays and in-store bar and billiard table. Minneapolis is the largest city in Minnesota. Along with St. Paul, Minneapolis is nicknamed one of the “Twin Cities”. Minneapolis is also known as the “City of the Lakes” for its many lakes and wetlands. The city has a thriving performing arts and music scene (the city is home to Prince). Minneapolis also features a beautiful park system which affords many opportunities for those who enjoy living an active lifestyle – like our friend Marty Mathis, who is an avid cyclist.